Last month I attended the annual PEERS Vampire Ball. 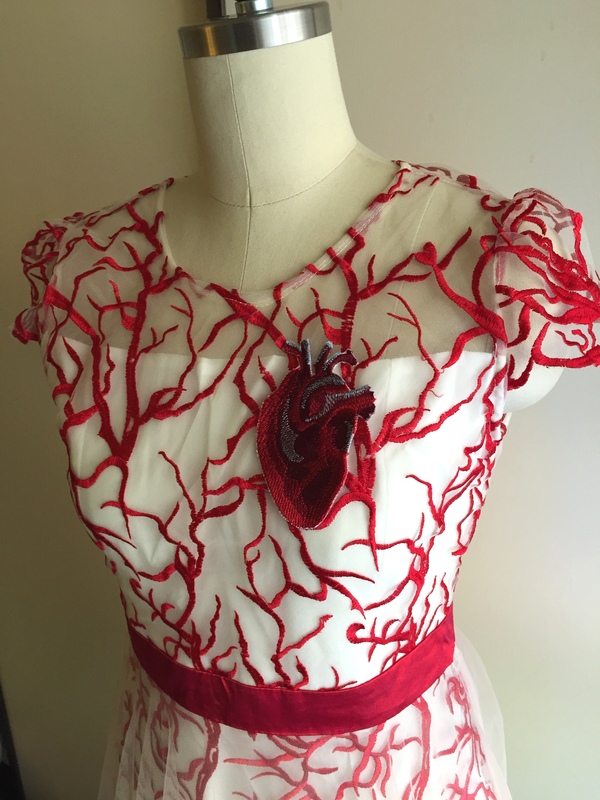 I wore a dress embroidered with blood vessels, a heart, and lungs. In a sea of black dresses I think I was pretty easy to spot! I’ve worn the dress before, and you can read about the details in a previous post. John Carey Photographic took some photos of me at the ball (thanks John!) that he’s kindly permitted me to post here. If you are curious, here are some pictures that show the whole costume. (Clearly, these were not taken by John). I think for the future I would like to dye my shoes red. (These are the Tissots from American Duchess). I am looking forward to next year’s ball, and being spooky again! Posted in Fantasy, Halloween, Miscellaneous and tagged blood, goth, PEERS, Vampire Ball. Bookmark the permalink. 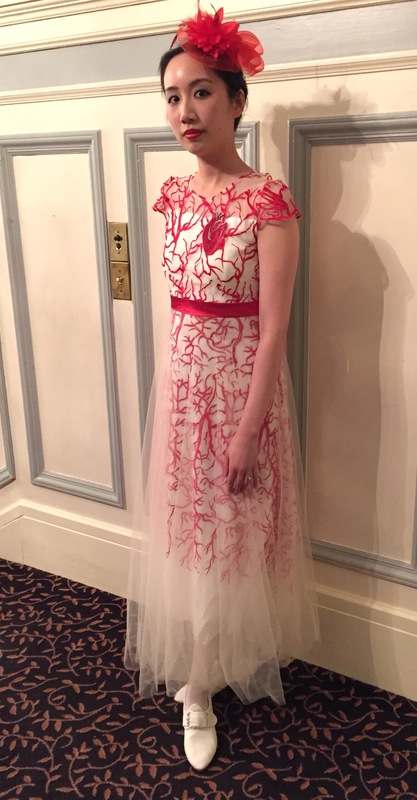 Last night I attended the annual PEERS Vampire Ball wearing my circulatory system dress, complete with heart and lungs! I did not have time to make a new dress from scratch, so I modified a purchased dress. 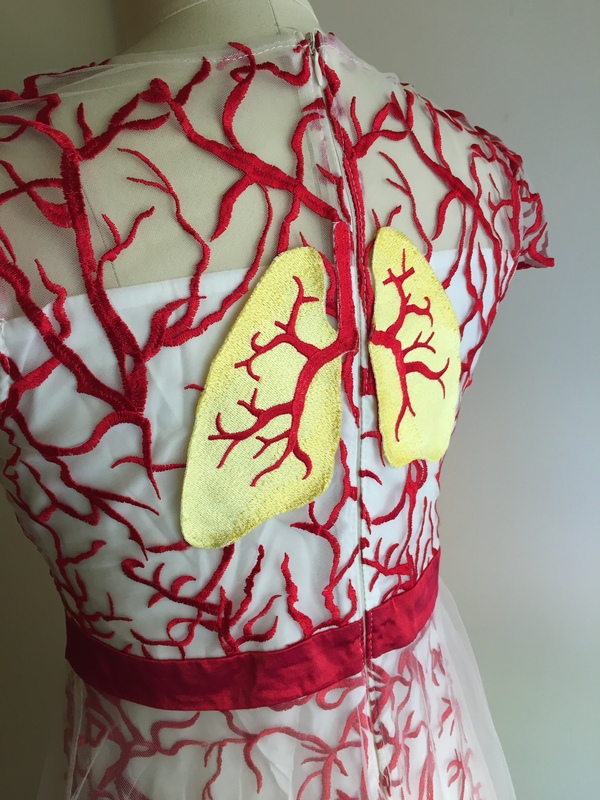 I have a friend with an embroidery machine (who has an Etsy shop), so I sent her the specs and I asked her to make me some heart and lungs in the size and color I wanted. I cut them out of the fabric base, fray-checked the edges, and sewed them to my dress. The dress was a hit at the Vampire Ball. Lots of people told me the heart was grotesquely cool, and when I turned around they were charmed by the lungs as well. Sometimes I backed up against a friend and said “I’m breathing on you!” because I’m that kind of weirdo. There were lots of amazing costumes at the event. I didn’t take as many pictures as I would have liked, but they are on my Flickr account. Posted in Fantasy, Halloween, Other Clothes and tagged blood, costume, goth, Halloween, Vampire Ball. Bookmark the permalink.